This am-756b 6 person bench spa by American spas features 56 jets crafted to maximize spa performance and deliver the highest quality hydrotherapy and relaxation experience. Designed to exceed expectation, American spas use a patented 7-layer laminate system, referred to as Fiber steel construction, which is reinforced with steel and wood to create the strongest shell in the industry. To further ensure durability and performance, this spa is built from the thickest acrylic available to keep the shell strong at critical stress points. And with the highest resin-to-fiberglass mixture and thickest fiberglass backing in the industry, you’ll be able to feel confident that your new spa is built with quality. This spa includes a freedom sound system with 4 waterproof speakers and a subwoofer for improbable sound. 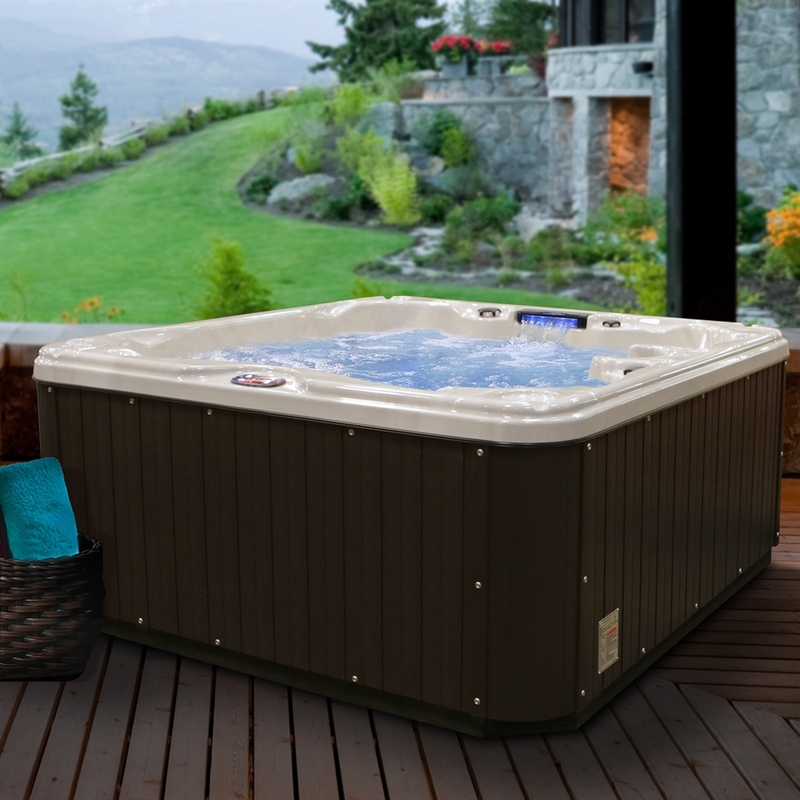 The built-in wireless Bluetooth technology means that you can regulate your music through a smart device from anywhere inside or outside your hot tub. Designed to meet strict standards in efficiency, insulation and sanitation, this 6-person spa uses smart technology to run efficiently and use less energy. Insulation keeps hot water in and cold weather out to reduce power needs and the energy Saver thermos layer insulation blanket provides an extra layer of protection for your hot tub from the elements. The hydro clear ozonator purifies water the use of active ozone Bubbles that keeps your water clean, clear, and sanitized for easy, hassle-free maintenance. To further reduce chemical usage, the pure float filter keeps the spa sanitized and keeps water crystal clean always. To give protection to your spa and investment, a premium hydro-armor tapered spa cover provides the final layer of insulation and protection. Energy-efficient and rated to resist 1,500 uv-hours of protection to prevent cracking, splitting, or fading, the hydro-armor tapered spa cover is designed with a tapered height that angles downward from the center to the sides to drive off rain and prevent precipitation from pooling.